5 shelf HPLC carts contribute to greater benchtop productivity. 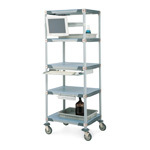 Mobilize and stack HPLC equipment on carts to maximize valuable lab space. Avoid crowding valuable bench top space with High-Performance Liquid Chromatography or other analytical equipment. Shown with optional casters and accessories, not included.